What’s New in Florence Museums? View of the Duomo in Florence from the Orsanmichele. Old icon, yes, but every view seems new. Note: This story was originally posted in January 2015. Florence never goes out of style, and the best part is that museums, churches and other sites are continually being updated. So for first time visitors, or for others (like us) who are diving into Florence after a few years’ absence, here’s a round-up of museums in Florence–all world calibre, rich with history, and filled with gorgeous treasures. These days, it’s advisable–and easy–to book tickets in advance for some museums to avoid long lines. On my fifth visit to Florence, Italy, everything old seemed new again. I loved Florence on my first visit in the 70s, and I still love it now. But my travel advice for the day is: don’t ever say “Been there, done that.” Maybe we’ve been there before, but Florence isn’t standing still. Museums and churches are constantly being adapted to restore and preserve art and to handle more visitors. ‘New’ is a relative term. We include the old classic museums, some newly updated, and some just new to us. For current pricing and to book tickets, check out Tickets Florence. The Uffizi, of course – 12.50€ per person. Arguably the world’s best art museum (C’mon, it has Botticelli’s Venus on the Half-Shell! ), the Uffizi Gallery seems to be under near-constant renovation. The current project is big. The Uffizi now consists of two full floors of fun, with a cafeteria rest stop opening onto a rooftop patio, expanded bookstores (accessible without a museum ticket, but after security), and the renovated tribunal room of Cosimo Medici I.
Museo Orsanmichele – Free, but open Mondays only. It’s a treat to visit this massive old marketplace building for views and a handful of sculptures, including many designed for this building’s exterior. The subject matter, though mostly religious, was at least created for the wealthy commercial guilds. 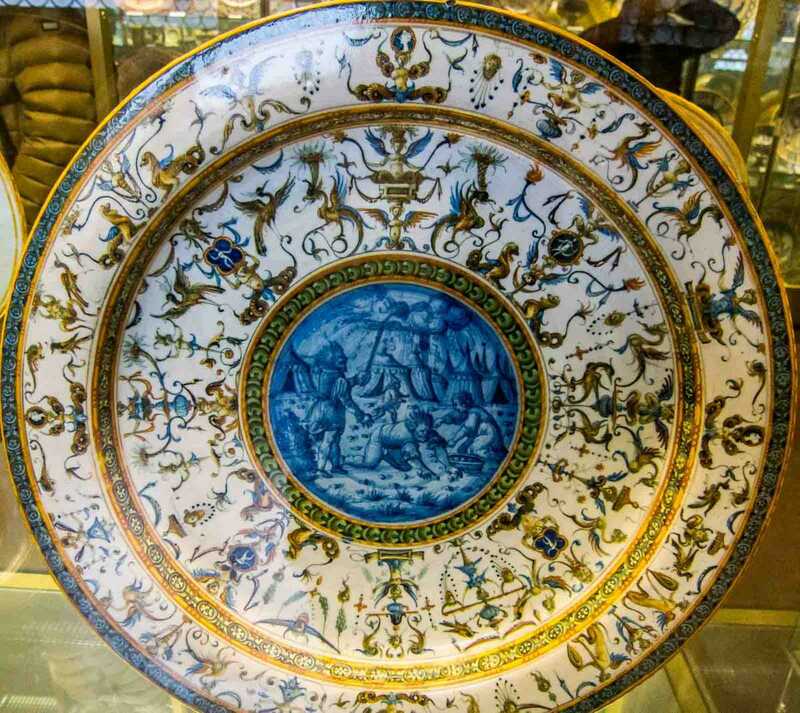 This porcelain plate from the private collections now in the Bargello, uses the popular grotesques found in the apartments of the Palazzo Vecchio. Palazzo Vecchio – Access and tours of the Palazzo Vecchio are always changing. In 2000, our family tour included a pass through the rafters of the great Hall of 500. New tours are broken into special interests. We chose a worthwhile, detailed tour of the palace from Context Travel. Other tours by special arrangement might include secret passageways or the famous Duchess walkway connecting the Palazzo with the Pitti Palace across the Arno River. Bargello National Museum – 4€. One of my favorite spots in Florence, because of the many sculptures moved here to protect them from the elements. The museum has expanded considerably, and now includes beautiful ivories, porcelain, enamels, and textiles from private Medici collections. Check out the miniature mosaic with tiles the size of pinheads. A musical instrument collection has been added to the Academy Museum, known for housing Michelangelo’s David and the compelling Prisoner sculptures. Galleria dell’Accademia – 8€. Besides David (and don’t forget Michelangelo’s Prisoners and St. Matthew are here, too) the museum now has a permanent room crammed with sculpture by Lorenzo Bartolini and Luigi Pampaloni (or did I just forget?). 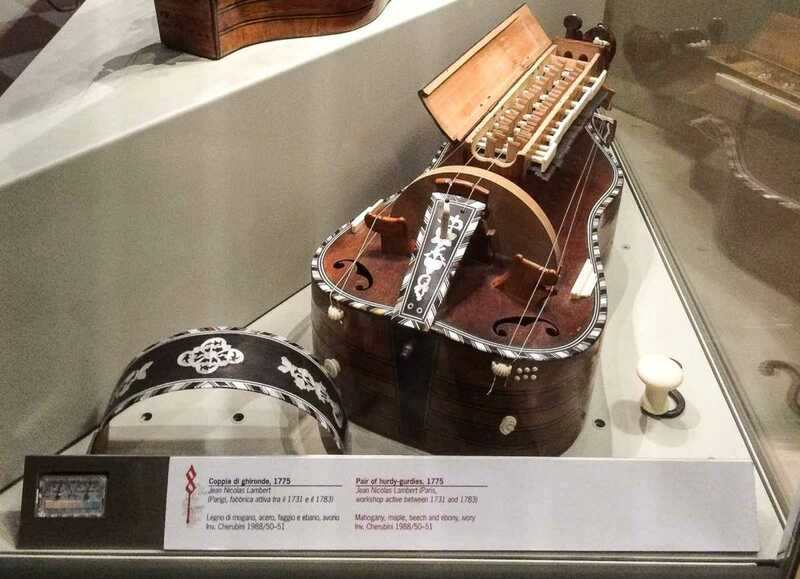 The best addition is the collection of old musical instruments. The Medici Chapel and the Medici Library (Laurenziana) – 7€ combined. Be sure your visit includes both parts of the Chapel so you can view the architecture of the big Chapel of the Princes, and the Michaelango sculptures in the New Sacristy. If you’re lucky, your visit to the outstanding library space (the inlaid floor mirrors the ornate ceiling) will include a temporary exhibit. We got to see an exhibit of ancient illustrated texts devoted to animals. 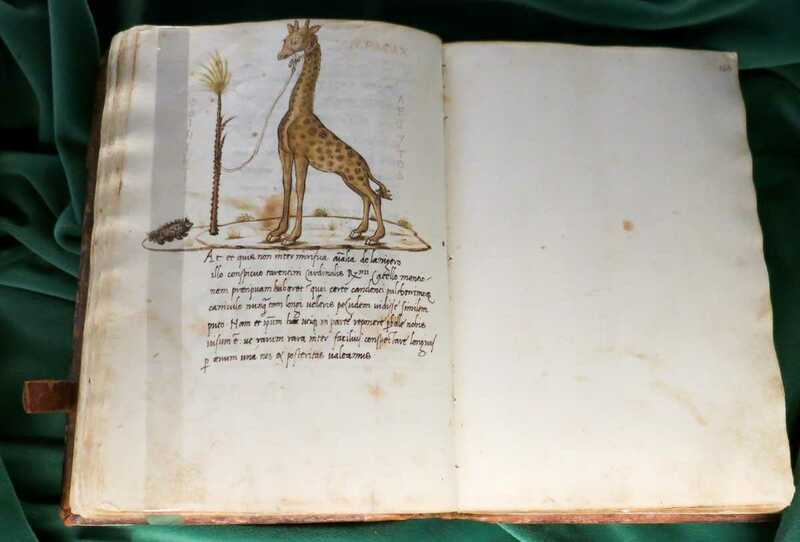 From a special exhibit at the Laurenziana Medici Library. Museo Galileo – 9€. This is entirely new, opened in 2010. Perhaps a guided tour would have been more fun. As it was, we enjoyed a couple sections on Galileo’s particular physics experiments, and seeing some of the scientific instruments. Ask for your discount to La Specola Natural History Museum, included with the rather pricey Galileo ticket. For more highlights of our Florence discoveries, read about our church visits and neighborhood walks. Those mummified hands are – to say the least – unnerving! Florence … on the other hand… deserves a round of applause. Forgive me! I couldn’t resist it! :) Your observations are fascinating, and the pictures super. An excellent roundup. Thanks, Ursula. Yep, I was a bit surprised to come across the hands and a complete mummy, too. Some of the Asian ivory carvings were outstanding–and also a surprise in that neck of the woods! I love how you guys travel. Jealous. I love your Zentangles! If I could get past the “trying to catch up on posts” facet of our busy travels, I might enjoy Zentangles, too. We’re seeing more than I can say, apparently. Those hands are creepy! Your post has reminded me I would love to go back to Florence. Both times our visits were too short and there is lots we haven’t seen. Great photos! 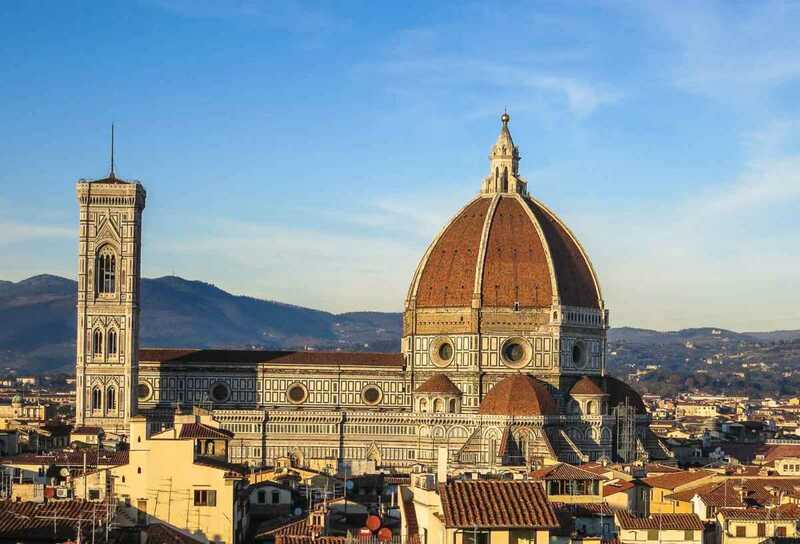 We’re headed to Florence in September and will use this as our guide. Many thanks!!! Yes! So glad to hear that. Check out the food and accommodations post, too. The Birth of Venus, aka, Venus on the Half-Shell!, is one of my all-time favorite works of art. Seeing it in person was such a thrill — the size! the vibrancy of the colors! Your listing of events and places you accomplished sounds like you must have been there for 2 months! Wow. Thanks for the very complete listing of things to do and see in that lovely Tuscan city. Thanks for this post! We’ll be in Florence in April, so it’s nice to read about your favorites. I’m so glad you find it helpful. DId you happen to see our post on food and accommodations in Florence, too. Check it out…and have a great time. April will be so nice. I’ve never visited there in the spring. I was in Florence once, quite a while ago, and what I remember is David, noisy motorcycles, and great steak and gelato. I can see that there is much more there than that and obviously need to return. We experienced a small earthquake when we were in Florence, and immediately the news was about funding to assure David is earthquake proof. He has a stress fracture in one ankle, so they are being extra careful. He’s always worth re-visiting, but yes, there is so much more to see! Hope you return soon.